The Pontine Islands are located in the Tyrrhenian Sea off the coast of Campania, although they are a part of Lazio. 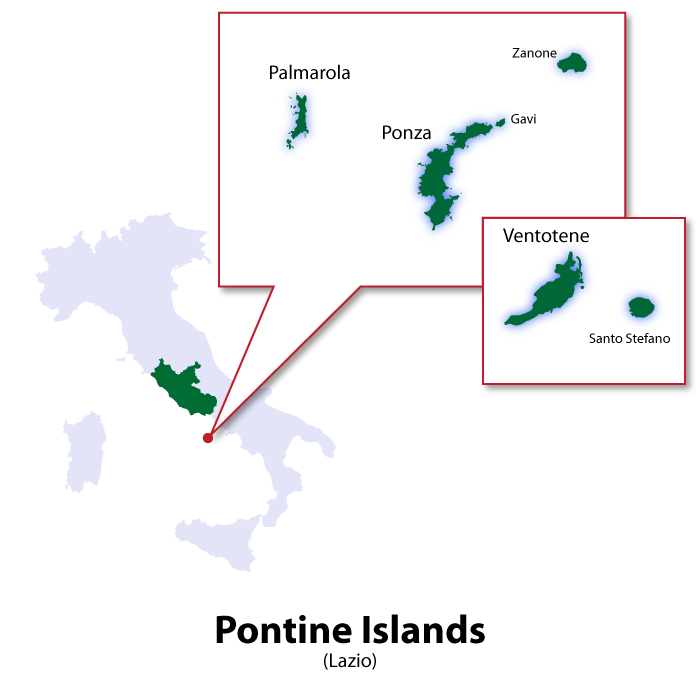 The Pontine archipelago consists of six islands: Palmarola, Ponza, Gavi, Zanone, Ventotene and Santo Stefano, which are spread over a distance of 22 nautical miles. 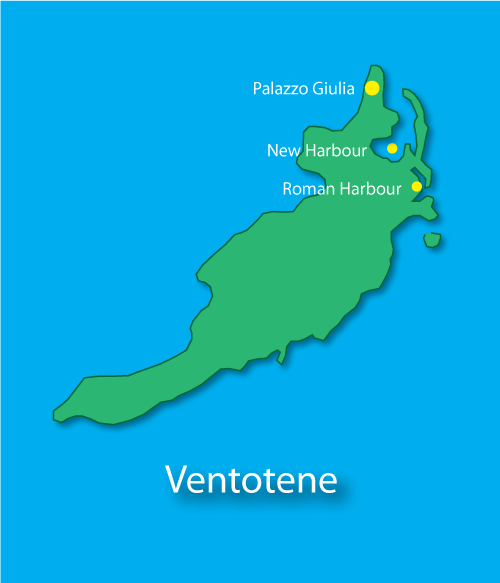 Ponza and Ventotene are the only two that are inhabited. 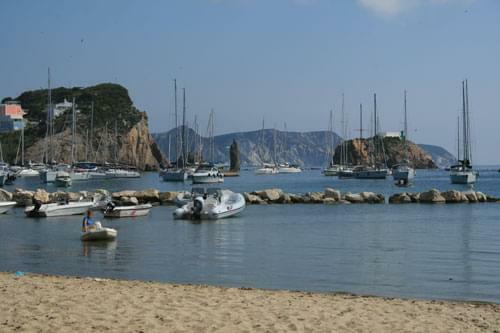 Palmarola is a favourite boating destination and has a landing stage and a restaurant open in the summer months. 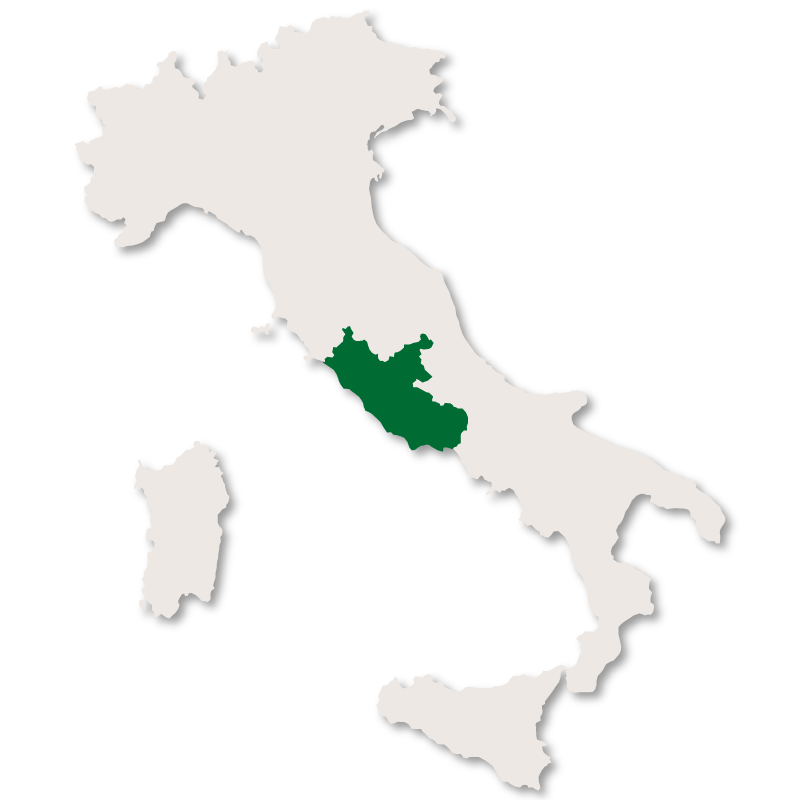 Zanone is a nature reserve but can be visited by boat and Gavi is privately owned and mainly inhabited by rabbits! Ponza and Gavi, the small island to the north, owe their distinctive shape to being formed from the remains of an extinct volcano. 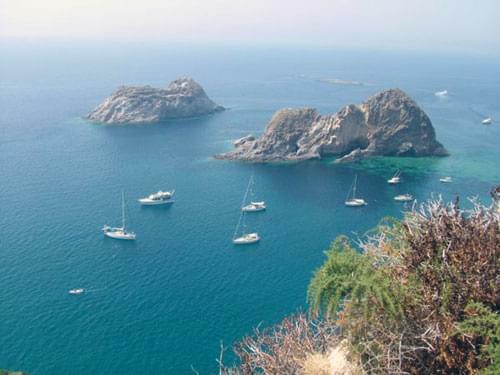 Ponza is the largest of the Pontine islands with a total area of 7.3 square kilometres. It is approximately 8.9 km long by 2.4 km wide at its widest point. 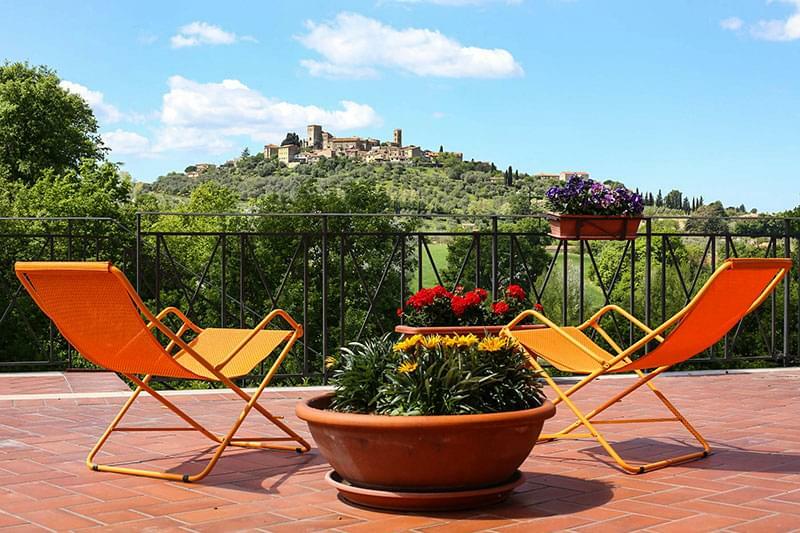 Originally colonised in prehistoric times, it was developed by the Etruscans and then the Romans but abandoned during the middle ages due to constant pirate attack. 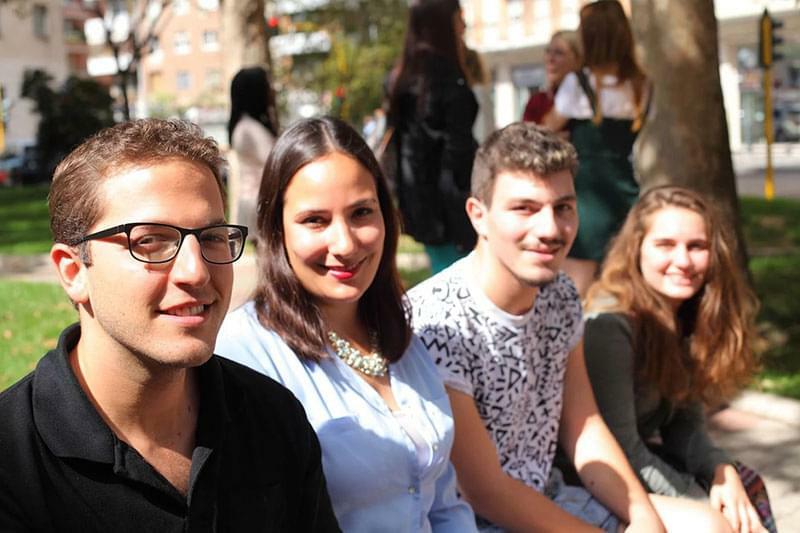 The island now has a flourishing tourist industry. Ferries from the mainland arrive into the pretty little harbour on the island's east side, packed with Italians who flock there on day trips during the summer months. 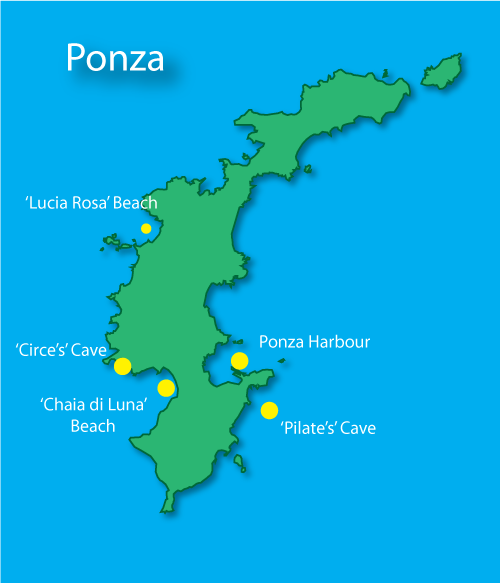 But Ponza is more than just a holiday island. It boasts a rich and colourful history, full of myths and legends, even if the truth of some of the stories is dubious. The first concerns the island's name. It is said to be named after Pontius Pilate, the Roman governor of Judea, responsible for sentencing Jesus to death. His family owned land on Ponza and there is a cave named after him. The second story concerns Homer's Odyssey. Ponza is said to be the inspiration for the island of Aeaea, the winter home of Circe the Sorceress. Having turned Odysseus's men into swine, she seduced him and spent a year living with him in a cave near 'Chaia di Luna' beach. A story probably more based in fact, was that Nero Caesar, Caligula's brother, was banished to Ponza and put to death there in 30 AD for conspiring to overthrow him. 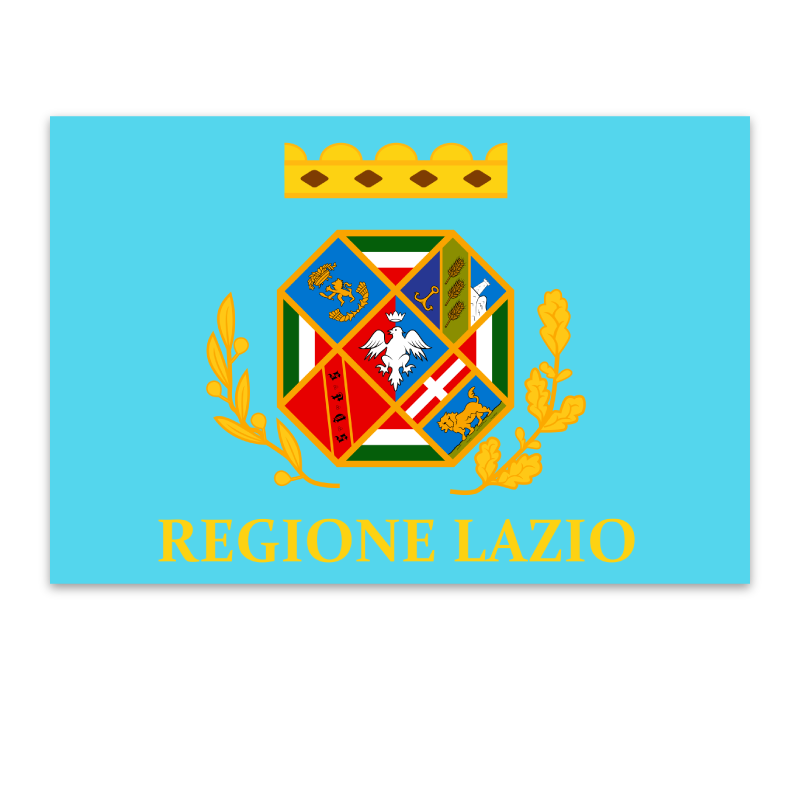 Two of his sisters, also involved in the plot, were exiled to Ponza and Ventotene for more than 10 years. 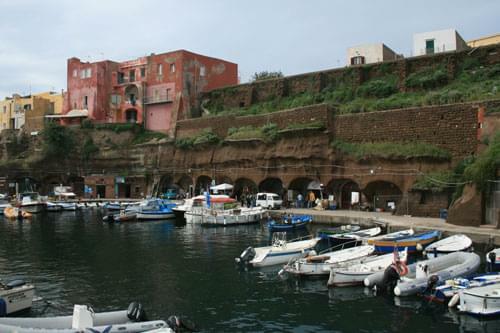 The island, together with Ventotene, served as a penal colony during Mussolini's regime. 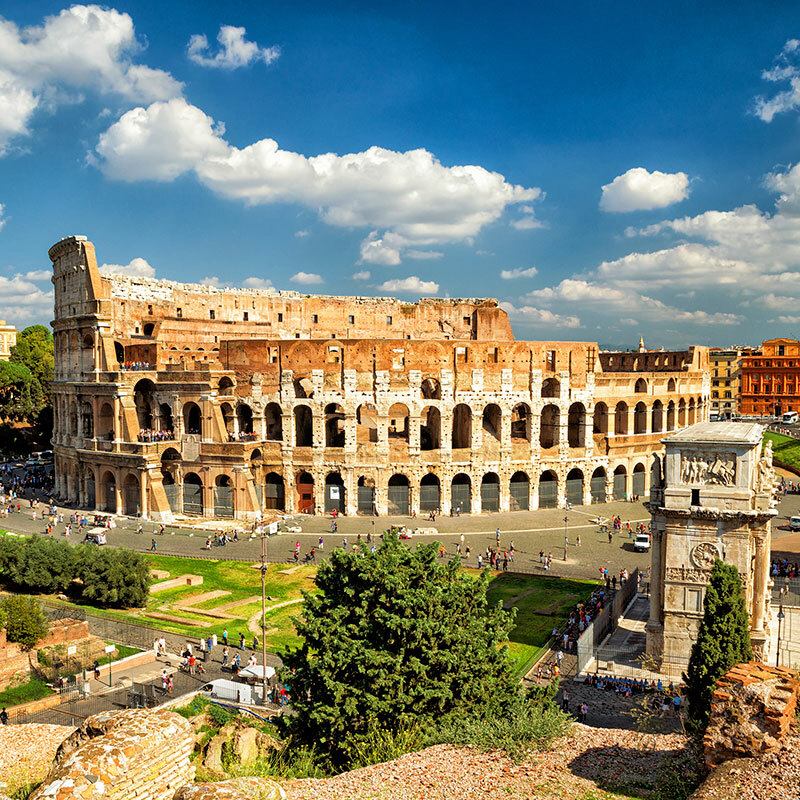 Ironically, Mussolini himself was held there for a short while just before his death in 1943. 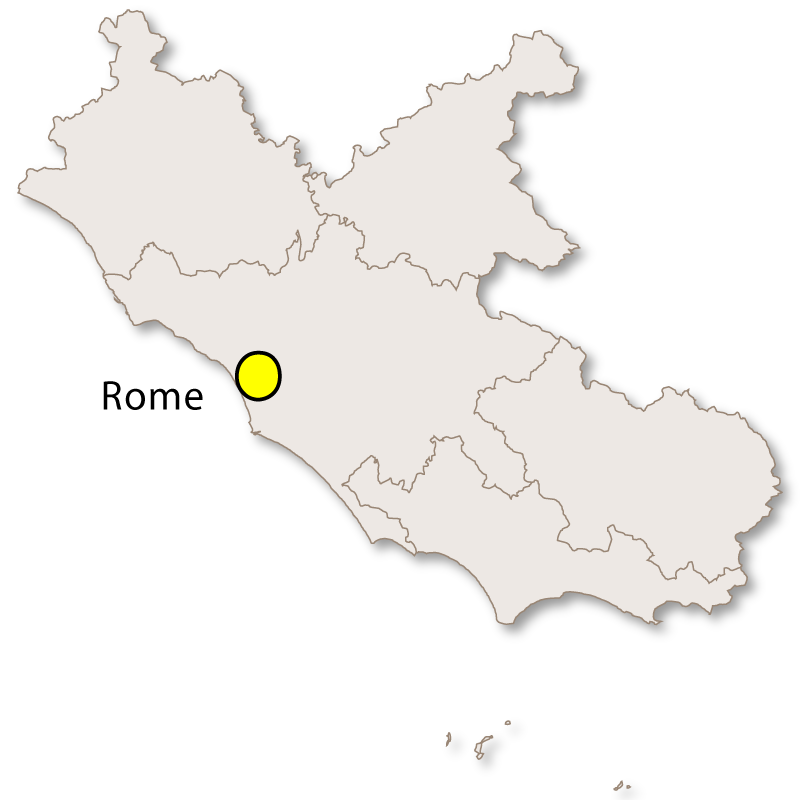 Ponza is also the location for the tragic story of Lucia Rosa. About to be forced to marry someone against her will, she threw herself into the Tyrrhenian Sea, becoming a martyr for women's rights and a symbol for human rights around the world. Palmarola is the second largest of the Pontine Islands, located 10 km west of the island of Ponza. It has a rocky coastline with many natural bays that provide safe anchorages, making it extremely popular for visiting yachts and motor boats. There are landing stages and restaurants that cater for visitors during the summer. Ventotene, which was called Pandataria in Roman times, is the third largest of the Pontine Islands and, along with Ponza, one of only two that are inhabited. It is 3 km long and only 800 metres wide. Ventotene's main claim to fame is for playing host to a series of banished Romans. In 2 BC, the emperor Augustus banished his daughter, Julia the Elder, to Ventotene because of her 'excessive' adultery. Later, the emperor Tiberius sent Caligula's mother, Agrippa the Elder to follow in her footsteps and she died on the island in 29 AD. Her daughter, Julia Livilla was exiled there twice, finally dying there herself. The ruins of her mansion can be seen on the 'Eolo' headland, next to the New Harbour. 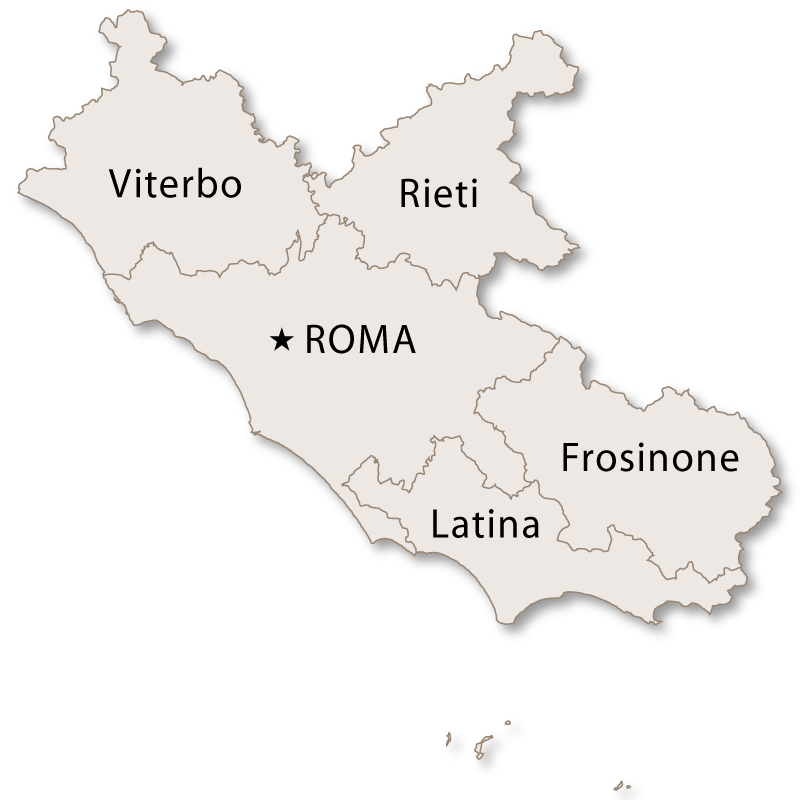 Finally, the emperor Nero banished his wife, Claudia Octavia, to Ventotene where she was executed soon after 62 AD. The tiny island of Santo Stefano, located 2 km from Ventotene's east coast, was developed as a prison island by the Bourbons and later used by Mussolini who incarcerated 700 political opponents there during the second world war.